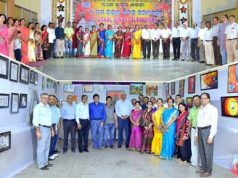 Bhubaneswar: A two-day training programme for teachers of primary and upper primary schools was organised by NTPC Talcher Kaniha under its CSR initiative. This programme aimed at developing conceptual understanding of teachers on child psychology, child development, child rights, key skills for teaching, classroom process management techniques and environment for quality education. Around 50 teachers of primary and upper primary schools of nearby villages attended the training programme held at Employee Development Centre of NTPC Kaniha on Sunday last. 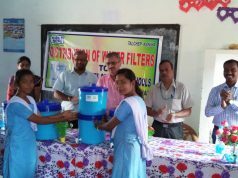 The training programme was organised in association with Trinity Foundation for Sustainable Development& Management (TFSDM), Sambalpur. Interacting with the participants during the valedictory session of the programme, VB Fadnavis, General Manager (Kaniha) said “Education has to be given lot of thrust and NTPC Kaniha is committed for the development and promotion of education as a CSR initiative”. In addition NTPC Talcher Kaniha under its CSR initiative distributed 650 winter clothes to blind and Physically challenged persons(PCP) on January 5. The programme was organised Utkalmani Gopabandhu Blind relief society, Kaniha on the occasion of 39th Blind Relief Society Function of Kaniha. NTPC Kaniha has been supporting this cause since 1994. VB Fadnavis, General Manager graced the occasion as chief guest and distributed winter clothes blind and PCP. Chairperson (Kaniha block), Zilla Parishad member and General Manager (MCL) were also present on this occasion. 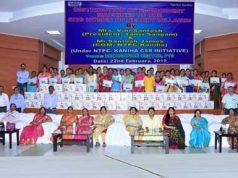 “It is noble initiative being taken by Utkalmani Gopabandhu Blind Relief Society, Kaniha for helping poor and needy of the society and NTPC Kaniha feels proud to be part of it”, Fadnavis said.